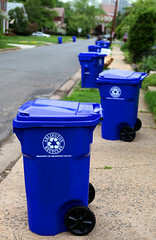 New blue single-stream recycling carts will be delivered to residences over a 6-8 week period in July-August. You may keep your current recycling bins to use inside your house if you like, but they will not be picked up at the curb. If you do not want your recycling bins then leave them at the curb and they will be taken away by the city. If you do not receive the new blue recycle carts please call Recycle Ann Arbor at 734.662.6288 or email info@recycleannarbor.org. Place the recycle cart at the curb on your regular trash day for pickup. Tenants may use their existing recycling stacking bins or tan and green carts until they receive their new blue single-stream recycling cart(s). They can blend all their recyclable materials in their existing bins effective July 5, 2010, as well as recycle additional plastics. Please visit www.recycleannarbor.org for more information on the switch to single-stream recycling.